Brian May has slammed The Sunday Times Magazine for a cover feature they ran last weekend. The guitarist says he gave the newspaper supplement exclusive rights to use text and images from his new book Queen In 3D and had agreed to an interview to discuss the innovative publication. May says on his website: “We gave the Sunday Times exclusive use of all the photographs in the book. They used just two of them, one of them reproduced not much bigger than a postage stamp, the rest of the piece illustrated with recycled ordinary snaps from God knows where. “The opening of the piece inside says, ‘Tragedy, debauchery... and dwarves.’ None of this tired old stuff features in the book or was discussed in the interview. “This woman came into my house, pretended she was a fan and was going to write a nice piece about the book, as agreed – then went away and wrote this pathetic sensationalistic drivel. 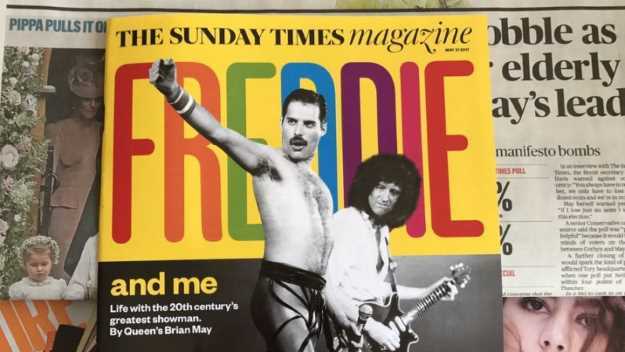 May says he kept “meticulously” to the agreement he had with the newspaper and refrained from sharing the book’s content with anyone else prior to the supplement’s publication – even though demand from fans was high at the recent Photo London event he attended to talk about Queen In 3D. Queen In 3D is out on May 25 and features more than 300 stereoscopic photographs documenting the band’s history – the majority of which were taken by May himself and available to view through his OWL viewer which comes with the publication. The guitarist previously published 3D images in Crinoline: Fashion’s Most Magnificent Disaster – written in conjunction with Denis Pellerin and the London Stereoscopic Company. May recently released his new album with Kerry Ellis titled Golden Days and will head out on the road with Queen and Adam Lambert from November.